Formula 1 boss Bernie Ecclestone is set to appear before a Munich court on Thursday, accused of giving a £27.5m ($45m, 33m euros) bribe to a German banker. Ecclestone allegedly made the payment in order to secure the sale of a stake in the F1 business for a company he favoured. Here, we look at some of the main issues surrounding the case. What is Ecclestone's alleged motive? The prosecution will argue that he feared losing control of a sport he had developed and built up from a niche activity pursued only by enthusiastic amateurs to the global multi-billion pound industry it is today. Gerhard Gribkowsky, the German banker who worked as the chief risk officer for the sellers, Bayern LB, was sentenced to eight-and-a-half years in prison in 2012 after admitting taking payments from the 83-year-old and his family trust, an entity called Bambino. The money was allegedly paid to ensure that Ecclestone's preferred choice of buyer, a company called CVC Partners, prevailed in their pursuit of Bayern LB's 47% stake. 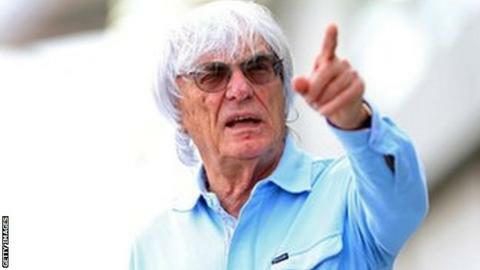 Ecclestone denies the charge and has consistently maintained his innocence. His lawyers are expected to argue, as they have in previous cases relating to the sale, that Gribkowsky was effectively blackmailing him, or "shaking him down", as Ecclestone has termed it. Why? The F1 chief alleges Gribkowsky was threatening to cause a major financial headache for him by informing British tax authorities that he controlled the Bambino trust. Ecclestone denies he controlled Bambino but says he feared Gribkowsky's claim would have triggered a lengthy investigation by the Inland Revenue into whether he did have control. If proven, and as a resident of the United Kingdom, he would be liable to pay tax on the estimated £2.4bn of cash in the family trust accounts. Ecclestone has said previously that he essentially paid Gribkowsky to make the problem go away and so the German would "keep calm". Can Ecclestone still do his F1 job? The court is expected to sit for 26 non-consecutive days before wrapping up on 16 September. Ecclestone is expected to attend the trial and give evidence but does not believe it will interfere with his day-to-day running of F1 during the season, which started last month and ends in November. However, after German prosecutors announced their intention in January to go ahead with the case against him, he stood down from the board of F1 and set aside certain executive duties pending the end of the trial. His long-term prospects of hanging onto his job depend upon whether he is found guilty. Donald McKenzie, the head of CVC and vice-chairman of Delta Topco, the company that controls the group of companies responsible for the promotion of the F1 and exploitation of its commercial rights, has said Ecclestone would be fired if he was ever found guilty of criminal wrongdoing. Is there a possibility he could be jailed? If found guilty, Ecclestone faces a prison sentence of anything between three months and 10 years. However, German legal experts say the maximum sentence is rarely handed down in such circumstances and a two-year term would be more likely. That could then be suspended. When Gribkowsky was sentenced in 2012, the presiding German judge, Peter Noll, described Ecclestone as the "driving force" behind the payments to the former banker. In response, Ecclestone said: "I think Mr Gribkowsky told them what he thought he had to tell them." He has been bullish on his chances in recent weeks. When asked, while attending a charity event in February, whether he was worried about the trial, he responded: "I bet you it doesn't happen." Ecclestone also won a civil case against a German media company earlier this year after it claimed it lost out financially over the 2006 share sale to CVC. Constantin Medien accused Ecclestone of making a "corrupt bargain" with Gribkowsky that would ensure CVC bought Bayern LB's shares. Mr Justice Newey found in Ecclestone's favour - but that is only part of the story. In his lengthy judgement, Newey said it was "impossible" to regard Ecclestone as a "reliable or truthful" witness. Is this the only bother he is in? Various civil cases from companies claiming they lost out financially, as well as a possible appeal by Constantin Medien, could be in the offing. But events within the Munich courthouse between now and September will largely determine the final chapter in Ecclestone's amazing life story, one that has taken him from selling cars on the streets of London to the head of a global sporting empire. The stakes could not be higher for both him and the sport he dominates.